Take your truck to new heights with Rough Country`s 3-inch body lift for 95-98 Chevy / GMC Pickups! This all-inclusive body lift kit comes with everything you need to gain additional ride height at a fantastic price with no unsightly bumper gaps often found on inferior kits!This simple solution provides enough wheel well clearance to run up to 33x12.50 tires and works great with factory or aftermarket wheels! Each kit includes a series of durable fiberglass reinforced Nylon body pucks for a lifetime of unyielding performance. 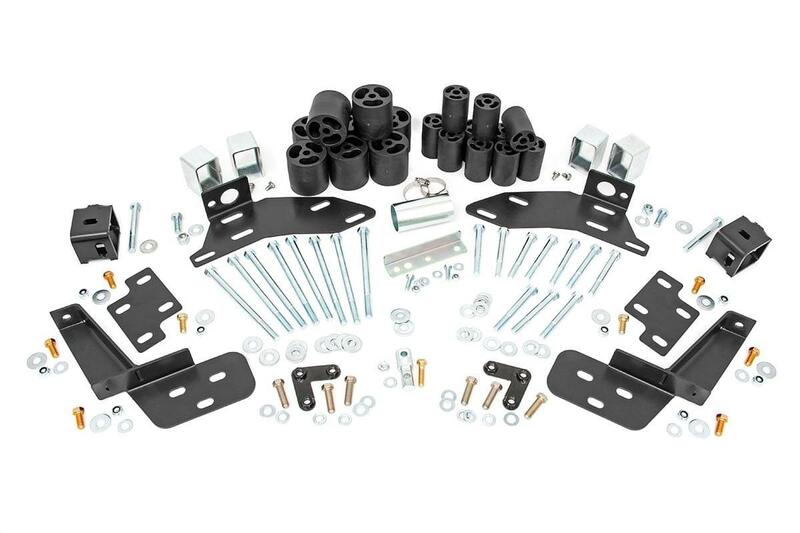 This kit also includes front and rear Bumper relocation brackets which relocate the bumpers to sit flush with the body of the vehicle. This fantastic feature eliminates the odd-looking bumper gap seen in other inferior kits. This kit also features a steering extension to ensure your factory components remain at the optimum angle after lifting. Best of all Rough Country Body Lift Kits feature a lifetime Replacement Guarantee!